Snakes: To catch or to Run? Cobras, gurzas, vipers - who wouldn't run if he saw one coming! In one bite the gurza secretes 200 milligrams of poison - enough to kill 100 men. It is also enough for more than 2,000 doses of valuable medicines, known as viprosal, lebetox and cobrotoxan. Viprosal is good for radiculitis, (inflammation of spinal nerve root), sciatica and polyarthritis. 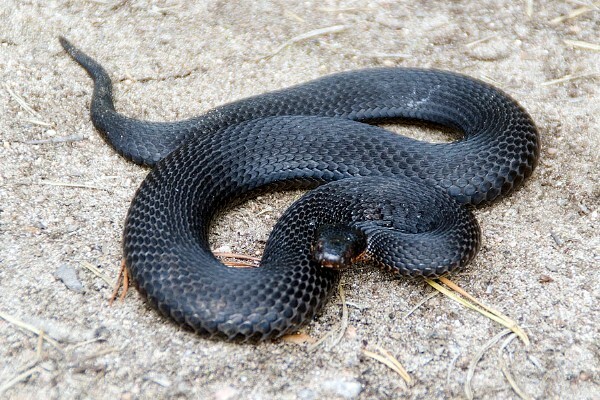 As for lebetox, it is a fact that victims of snake-bite die without losing a drop of blood, and this property of snake poison to cause blood to clot instantaneously is the principle on which lebetox acts. Hemorrhage from a deep wound in the stomach, neck or chest cannot be staunched by a clamp or tourniquet, and the victim will quite likely die from loss of blood. But a dressing soaked in lebetox and placed in the wound will immediately stop the flow. 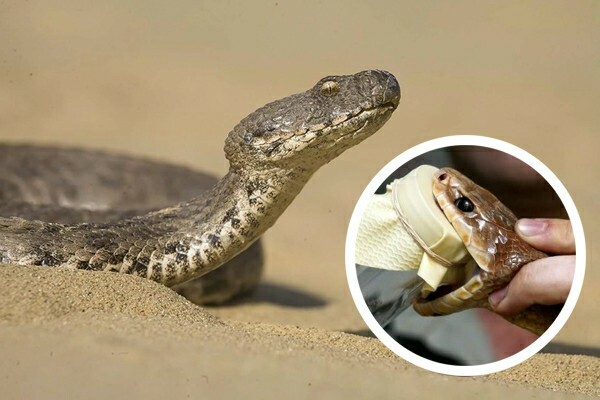 Corbotoxin, a preparation obtained by Soviet scientists from cobra venom, opens up new prospects in the treatment of asthma, hypertension and various tumours, including some malignant ones. Black adder poised for attack. It may be useful to remember that a snake can only strike if you are standing a third of its own body-length away from it. Out of death comes life. But no snake will give up its poison unless it has some kind of victim, and the stuff is required by the pound if it is to be used for medicines. The answer is to catch the snakes and "milk" them. It is a fairly simple business to "milk" a snake. You take a gurza, for instance, by the neck and give it the edge of a glass to bite on. In a few seconds some drops of the valuable poison will appear at the bottom of the glass. This can be done only once in three weeks, and after three "milkings" the snake dies. As the pharmaceutical factories constantly need fresh poison, more and more snakes have to be caught all the time. To catch or to run? If you had a choice of trying to catch a snake or running away from it, you'd probably plump for the second. I would have done so myself before I became a snake catcher. Now I know it's easier to catch a snake than you might think. I wander through a bog dotted with mossy hummocks. Not one tree stump or root, not one bushy shrub escapes my eagle eye. In my right hand I brandish a metal poker-like affair with a crook on the end, and in my left I carry a canvas sack with a ferociously hissing load inside it. Suddenly I spot such an enormous snake that discretion seems the better part of valour. But I have a contract in my pocket, in which I have undertaken to catch at least 500 vipers. So far there are only a couple of dozen in the sack. The snake is lying in the blazing sun pretending to be warming itself. In fact it is guarding its prey. I steal up to it, it flickers towards its hole, and I spring, pinning the viper down with my crook. "Milking" time - and the milkmaid will have enough poison to make more than 1,000 doses of medicine. It bites viciously at the metal, at my boots, at everything in reach, leaving tiny drops of deadly poison. Snap! I have squeezed the snake's jaws shut with the pincers and am picking it up. It flails furiously with its tail, wrapping itself round my fist. Its fearsome, venomous fangs are no more than a third of an inch from my ringers. My hand is sweaty and my fingers begin to slip. In another instant, it seems, the snake will wrest itself from my grip - which means that I'll probably be bitten. If the poison gets into a vein, that's probably the end of me. As the thought flashes into my head my fingers grip the snake convulsively. The viper gasps, grows limp. This won't do at all. What good is a crippled viper? I relax my hold just a fraction. Then I put the tail into the sack and thrust the snake's head downwards. The viper turns about in an instant, and tries to burrow its way through to the outside. All the snakes already in the sack wriggle after it. At last I get the mouth of the sack secured. I wipe the sweat from my brow, and realise I no longer have that revolting lump of ice in my chest. But a man can get used to anything. In a couple of days you find yourself picking up snakes like firewood. You become more careless. And when complacency creeps in, danger is not far behind. It rears its head when you least expect it. The hunting had been especially good that day. But when I slipped the twentieth snake into the sack, it recoiled and leapt out. Its shortest route to the ground was via my left hand, which was holding the sack. It slithered down my arm. The normal reaction would be to pull one's arm back quickly. But that would have been fatal. Within a short distance the snake orientates itself by a kind of thermostat arrangement, and takes a bite at anything radiating warmth. But it does not attack an immobile source of warmth. The viper crawled and crawled. By the time its head got to my elbow it dawned on me what I had to do. I cautiously took out the pincers with the other hand, gripped the snake by the head and popped it back into the sack. Three weeks went by like that. Twenty-one days after vipers. Eighteen wearisome miles a day. There were many duties to be carried out on our snake-hunting expedition - those of catcher, cook, scientific supervisor, cameraman and porter. But all the jobs were combined by two people - Arkadi Nedyalkov, Master of Science, an experienced catcher of snakes, and me, a journalist who had decided to become a snake-catcher for the time being. I had been wandering about the bog for two hours and hadn't caught a single snake. Suddenly I came across a strange sight on a sheltered patch of green. At first I thought it was simply a fight. But as I looked more closely I realised that it was an affair of honour. Three pairs of males, grey, reddish and black, were hissing threateningly and hurling themselves furiously upon one another. With a smart rap on the head, a snake would push his rival aside. The one that had got the worst of it would lie still for a bit, then rise and return to the fray. They did not use their poisonous fangs at all. The loser would simply slide away in disorder. From a hummock, where she had a soft mossy bed, a great grey she-snake looked on lazily at the skirmishing. Finally there were just two contenders left. Whereas the female had been looking on at the tournament with indifference so far, now she began to get excited. She raised her head, then coiled herself into a ball. The protagonists grew quiet. There was a hiss from the female, a signal - and the stronger male flung himself upon his rather battered rival. After that the improbable happened. The female rushed to the two claimants, and the three snakes entwined in one ball. In a second I had them in my sack, along with the hopeful males defeated earlier. That is the question that has been bothering me all day, as we measure snakes and pack them in boxes. The box is on the table and the snakes are in the sack. I remove the lid and take up one corner of the sack with the pincers, while my partner takes the other corner. He removes the clamp, and then 40 snakes are writhing in the box with a dry, eerie rustling. While some are still being emptied out on to the top, others are already trying to burrow up from the bottom to escape. Immediately there are dozens of protruding heads. Somehow or other we get all the snakes into the box. And after a breather we set to with the pincers again. I take off the lid. A dozen snakes climb out of the box at once. But I am supposed to let one out, just one. Crack! Arkadi seizes a snake with his pincers and slaps it on the table. I chase the others back into the box and put the lid back on again. He picks up the snake by its neck and its tail. He examines it carefully. Then he holds a tape measure by it and announces succinctly, "Female, Black, 29 inches." I scribble away, throw down the pencil and move back the lid again. Once more several snakes get out. He catches hold of one. He measures it. I write, fling down the pencil, move the lid. The cycle takes seven seconds. If you delay, your colleague is in danger. Several times we almost slip up. One snake wriggles out of Arkadi's hand, and it is only because it has been rather flattened by its fellows that Arkadi's finger is not bitten. The ones that are after my hand are more active, but they have to make do with my shirtsleeve. One of them becomes so infuriated that it clings on with a deadly grip. I grab it by the neck and jerk it off. When I look at my sleeve I am at a loss for words at first. There are two poisonous fangs in the cuff. "Hm! Looks as though I've maimed that one." "It doesn't matter," Arkadi consoles me. "It'll grow some more." When I begin to feel dizzy from seeing so many snakes, when my hands begin to move sluggishly and are criminally negligent, when dusk starts to fall and we have to switch on the headlamps . . . then I find myself wondering about one thing only: how to learn the secrets of the fakirs! "If only I knew how to charm them," I think. "They'd be lying on the ground, and all I'd have to do would be to say, 'Next, on to the table!'" I decide to do something about it. I know one thing: the fakirs use music to influence snakes. I start with folk songs. Then I go on to some long-drawn-out operatic arias. To wind up, I recite poetry. But it is no good. "What do you think you're up to?" "I'd like to become a fakir - just for two hours!" "If only you'd told me before!" Arkadi snaps. "I'll teach you. First learn to pronounce this word, syllable by syllable. Char-la-tans! Got it? Now I'll show you. "Fakirs usually work with cobras. Right? It looks effective. The cobra stands up on its tail, puffs itself out and sways back and forth. It's about . to strike. The snake-charmer sits there with a mysterious look on his face, playing the flute. And the cobra couldn't give a damn for that plaintive melody. It can't hear it - got no ears! Snakes have only seismic hearing. That means that their bodies are receptive to the slightest tremors in the ground, but are completely unaware of airborne sounds. Incidentally, you've already taken the first step on the way to becoming a fakir. You remember the snake whose fangs came out in your cuff? That's how all the fakirs start. They give the cobra a bit of rag to bite, so that its fangs come out. But in a couple of hours a reserve pair appears - then the operation has to be repeated. Samples of medicine made from snake venom - that tube on the right might relieve your sciatica. 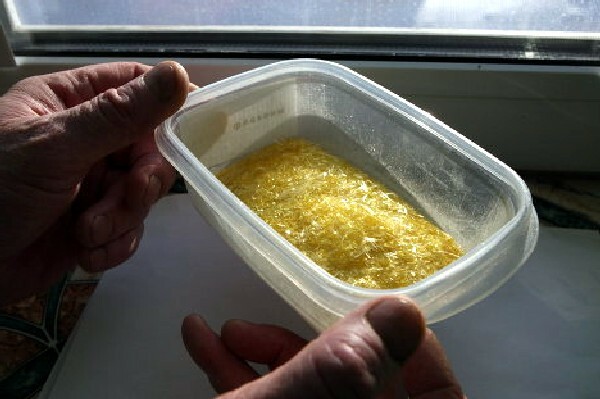 On the photo is crystallised venom, from which the medicines are obtained. Now that there's no risk, pick up your flute, your trombone, your poker, whatever you like, and wait. The cobra may remain in a threatening pose for hours. Annoy it. And as soon as it moves towards you, wallop it on the nose with your trombone. After all, the nose is the most vulnerable part of most animals. The cobra will have another go. You have another whack. You repeat the performance about 20 times. Then you can sit by the snake and play a tune on the poker. The cobra will hiss, threaten and sway, but it will not strike as long as the object which has been used to strike it is there before its eyes. But in a month its fangs will grow again, and the cobra will be a deadly menace once more." When we had fastened down the third box (each box held 50 snakes) I asked, "How about the boa constrictors at the circus?" "Like the fakirs, the circus people have their 'bits of rag'. Only they're called safety precautions. Before going into the ring, the snake tamer puts his boa constrictor in the refrigerator for about an hour and a half." "You remember how we caught vipers in bad weather? Cold also makes big snakes sluggish, weak and drowsy. In the ring, the tamer coils the sleeping constrictor round himself. But when the snake is warm and hungry, it's better to keep your distance. Nothing can help you otherwise." It was midnight, and we had nailed down the last box. Early next morning we loaded the boxes on a launch and left for Vologda. The cargo of snakes was flown to Bishkek, capital of the Kyrgyzstan, where there are facilities for extracting the venom. We spent three days getting well and truly clean, and sleeping and eating our fill. While we were doing that they were "milking" our snakes away there in Frunze. The venom they got was enough for 100,000 doses of viprosal. Every mile we had travelled through the bogs meant health for hundreds of people.